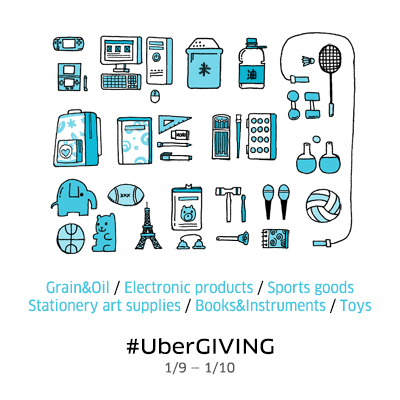 UBERGIVING – HELPING BEIJINGERS GIVE BACK THIS NEW YEAR! This weekend, give back to Beijing with #UberGIVING! Introducing #UberGIVING – Helping Beijingers give back this New Year! This weekend, give back to Beijing with #UberGIVING!We’re used to using the Uber app to get a car at the touch of a button to get where we need to be. We’re proud to provide a reliable ride for you, but now we want to do more. With a network of thousands of riders and drivers, we’re using our technology to help give back to our Beijing community. This weekend (1/9 – 1/10) from 11am – 4pm, Beijingers will be able to request an #UberGIVING car to come and collect items from your home or office to be donated to Beijing’s leading community charities，RoundAboutChina and Lion Club. In return, the #UberGIVING cars will be dropping off a THANK YOU Uber bear! 2. Invite your friends to join you, so you and your friends are able to donate more things at one time! 4. Demand will be high and rides are limited. Please be patient and keep trying. 5. All of the donations will be delivered to RoundaboutChina and LionClub. Simply forward the picture below to your friends and start GIVING together! New to Uber? Sign up and enter the code THANKYOUBEIJING in your Uber APP to get your first Uber Beijing ride 30CNY off.